How Republicans flipped on the DREAM Act in one month. 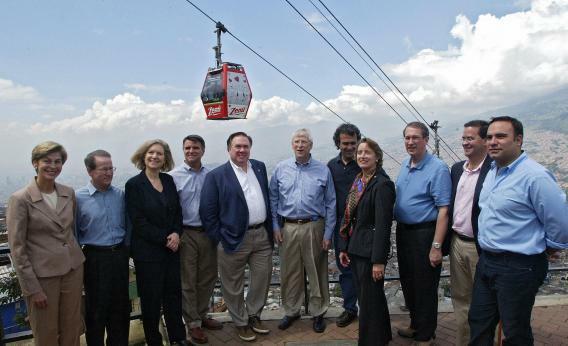 Bob Goodlatte, pictured here third from right in Colombia, prefers KIDS to a DREAM. Back on July 3, I noticed that Republicans being grilled at town hall meetings were sounding more and more open to citizenship for “Dreamers.” Rep. Bob Goodlatte, the chairman of the House Judiciary Committee who’s about 0.006 percent as well-known as Lindsey Graham but 10 times as important for the bill, was confronted by a 16-year-old whose parents had brought her into the country illegally. “People like you should be addressed,” he said. A week later House Republicans held an air-clearing meeting about their next moves. Member after member agreed that young Dreamers might be worth giving citizenship to. So: In the last 24 hours, immigration reporters have gotten Goodlatte to talk about his plan to fix this. The bill, tentatively named the KIDS Act, would be a Republican alternative to the Dream Act that failed in the Senate in 2010, and would allow undocumented young people to become legal residents. Although offices for Cantor and Goodlatte would not get into details or the timetable, Cantor has said previously that undocumented immigrants who came to the U.S. as children should be allowed to become citizens. The KIDS Act would be one of several bills that the House could consider on immigration reform as part of its piecemeal approach. So far, Republicans seem far more comfortable with legalizing so-called Dreamers than they do with a path to citizenship for their parents. And yet just a month ago, Rep. Steve King added an amendment to the Homeland Security funding bill written to end a policy begun by Barack Obama in 2012—“deferred action” on deporting illegal immigrants under 30. It was seen as a pseudo-DREAM Act, and the King amendment was seen as a pseudo-repeal of psuedo-DREAM. It passed, 224-201, with all but six Republicans voting with just three red-district Democrats. What happened? The Senate bill really did put some fear into House Republicans; the King amendment is going to have to be explained as blow against executive overreach, not as anything to do with Dreamers.